: Just a little ways to go and we'll reach the Iron Gear. : We'd better get a move on, Guld. 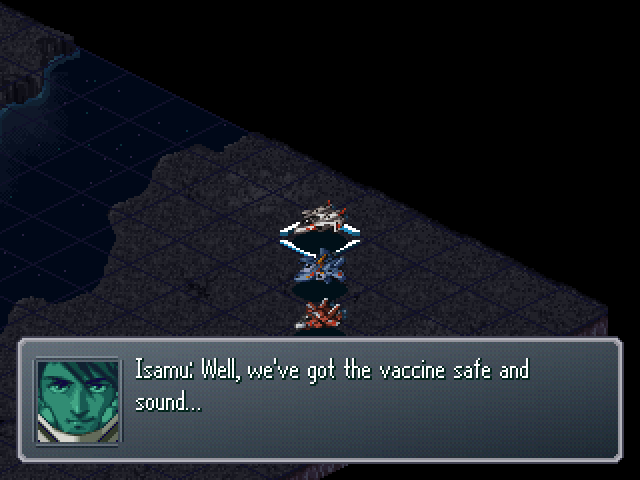 : ...Isamu, doesn't it bother you that I wasn't affected by the Rat Fever? : ...You've got the same luck as I do, right? : What're you talking about? 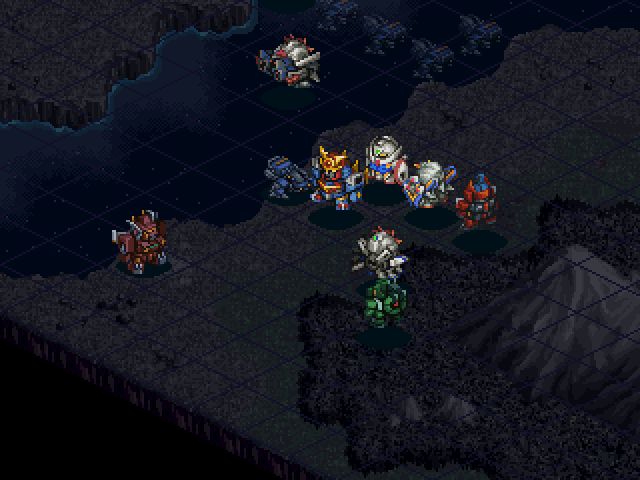 Those guys are as huge as Valkyries, right? How could one of them wind up being your father? 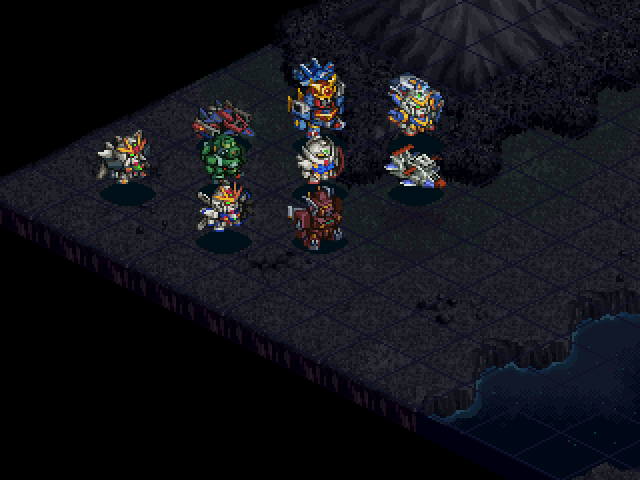 : Look at Milia, they can live like Earthnoids through Miclonization. : ...I thought I told you we could forget about all that old baggage. : Don't worry about that junk. We're even now. 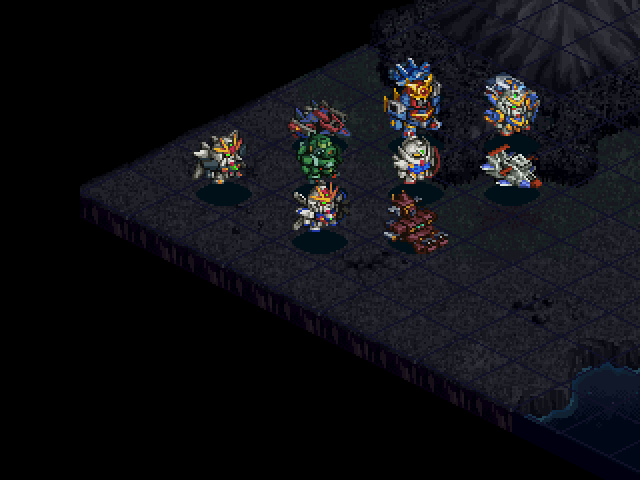 : ...And look at Max and Milia. In a few years, mixed races won't be rare. ...Who cares how you were born, you're a friend to both me and Myung. : Unmanned fighters from the Innocent!? 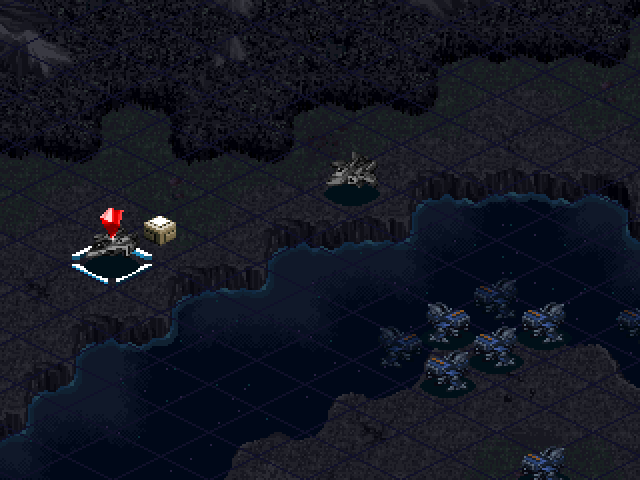 : It seems we've been boxed in by the enemy. 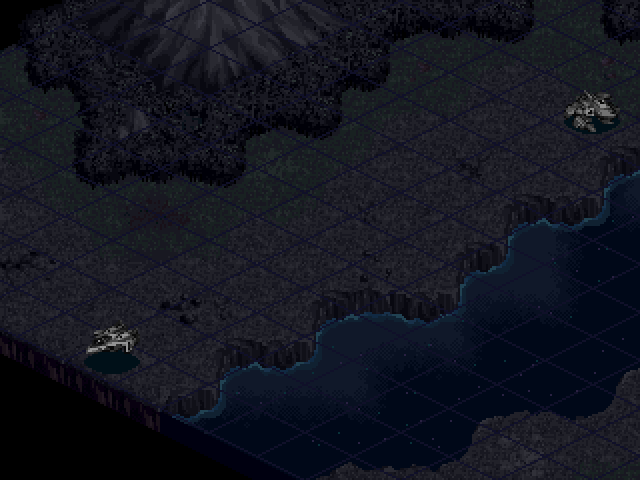 : ...Then we'll just have to break through by force, won't we? : Head here. If we do that, we can escape from this airspace. : Alright! Let's do this, Guld, Milia!! 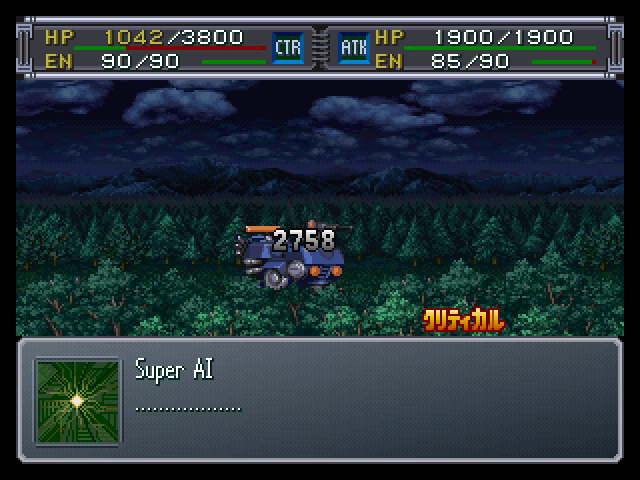 The Skill point for this mission is more complicated than for other missions. You need to do three things in order to get it. 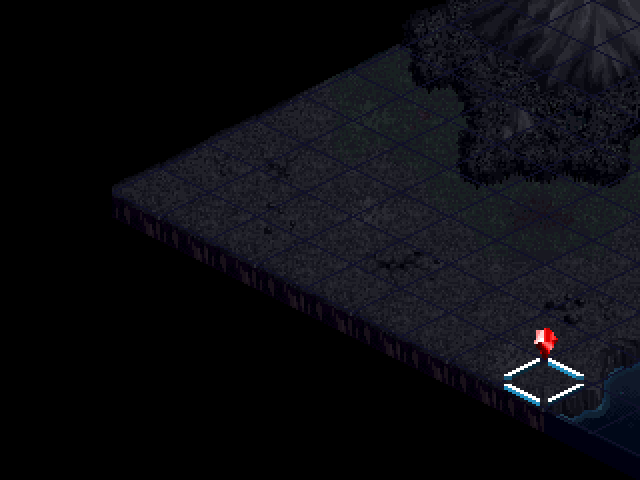 The first is to make it to the exit area in 4 turns. 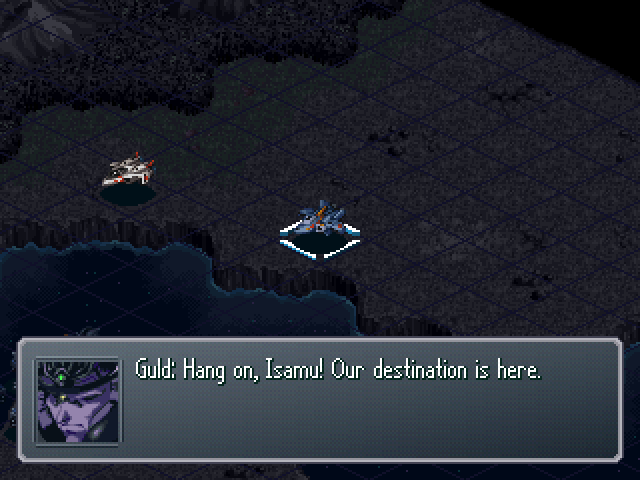 Only one person has to make it, and the only one who actually has a chance at getting there in time is Isamu. 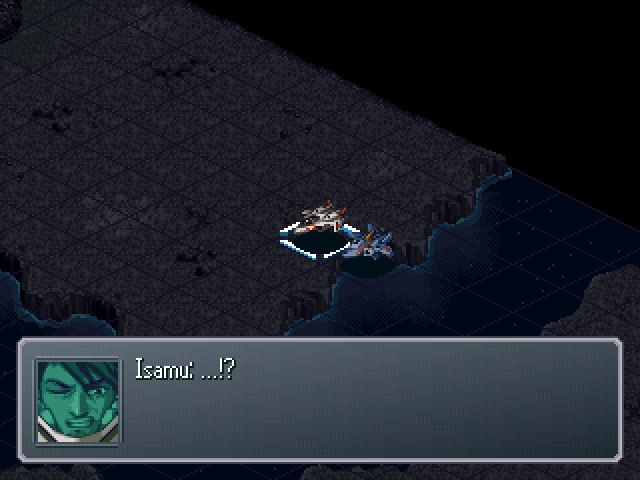 : What's wrong, Isamu? 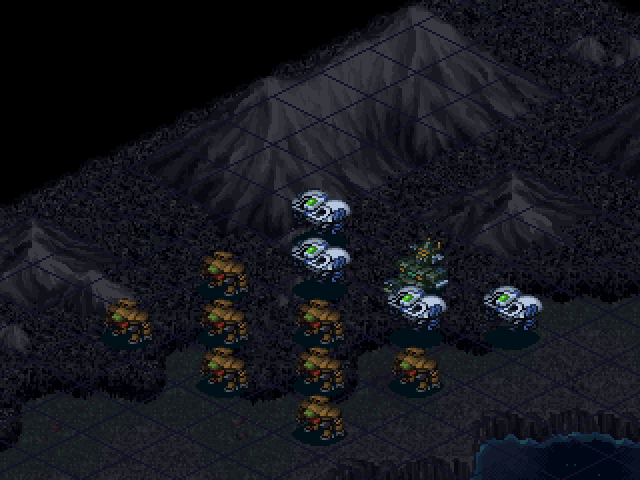 The enemy's on the move, don't slip up now! 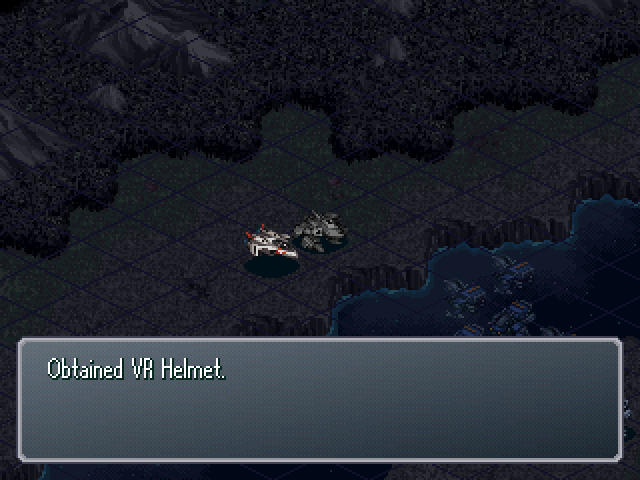 : Isamu, you're falling behind. : ...Don't tell me you're...? 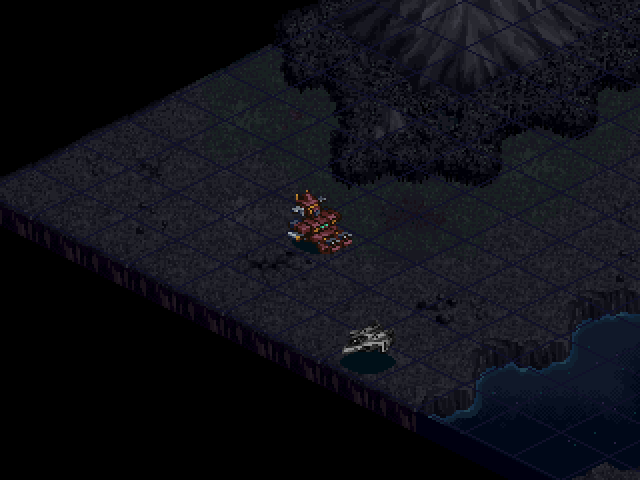 Isamu starts to lose control of his Valkyrie. : Heheh... Boy, I must look stupid, catching Rat Fever on the home stretch... I'll just slow both of you down, the way things stand. : You think I'd follow that kind of advice? 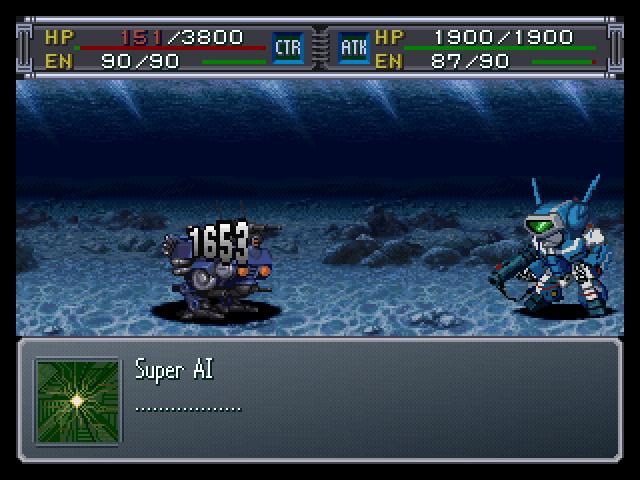 : Hmph... You must've reverted back to how stupid you were as a kid. Plus, I'm not about to break my promise to Myung. We're going back together. : Got it? You're sick, so just keep quiet and follow my instructions. : Tch... I don't have the energy to talk back right now or else I would. : Good, don't get seperated from me. Milia, we're getting him out first. 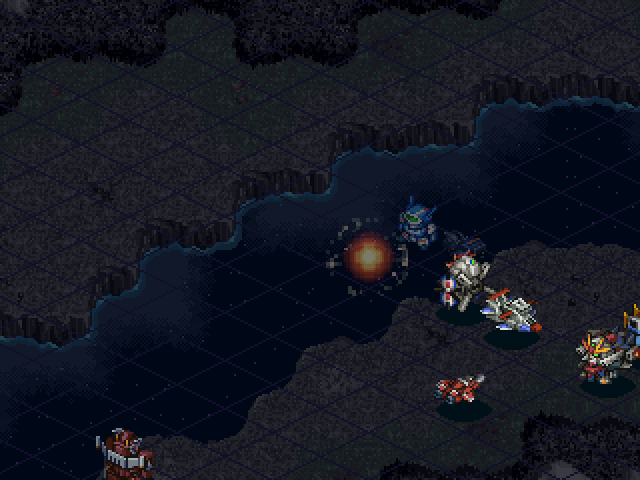 Milia grabed the container in front of her (Which contained a Computer Core) while Isamu and Guld head for the exit. 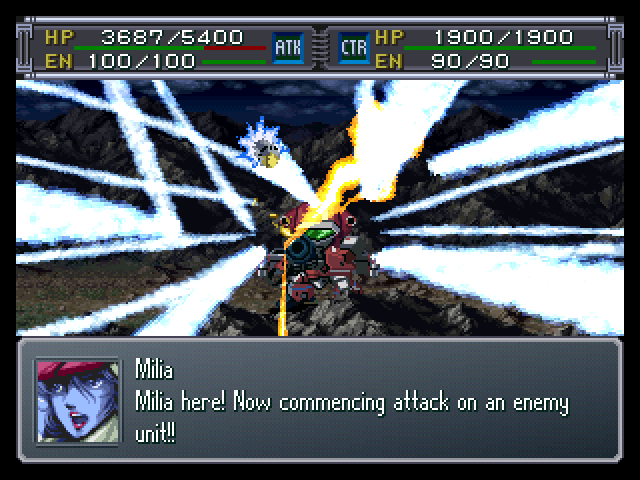 A lucky Critical from Milia brings down the first enemy. 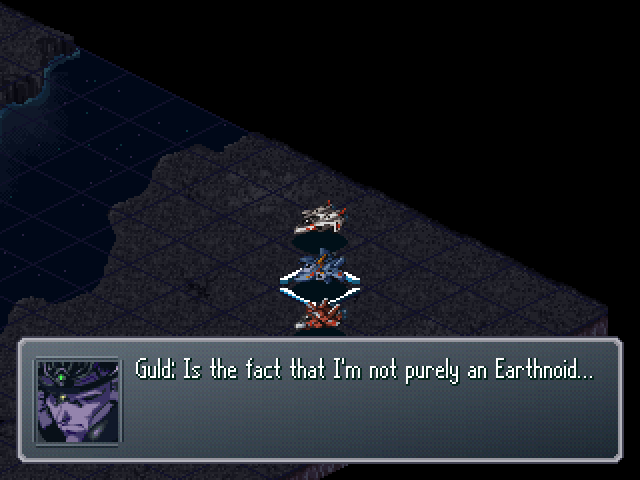 I expected a majority of the enemy to go after Milia, but it seemed like they were more interested in Guld and Isamu. so only two or three of them went after her. 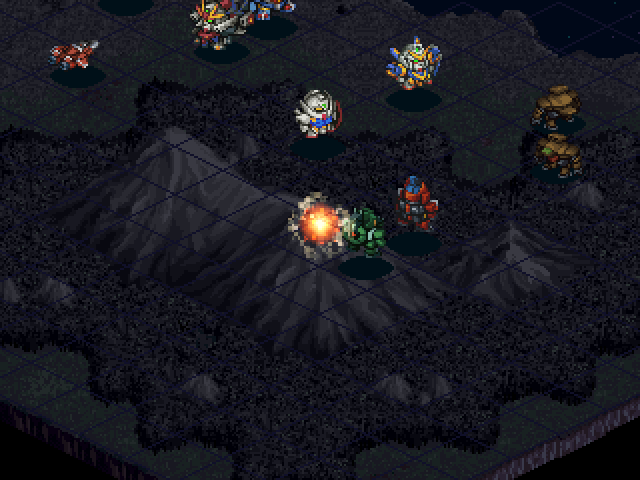 As usual for missions of these types, one of the characters will point out the destination at the begining of every turn. 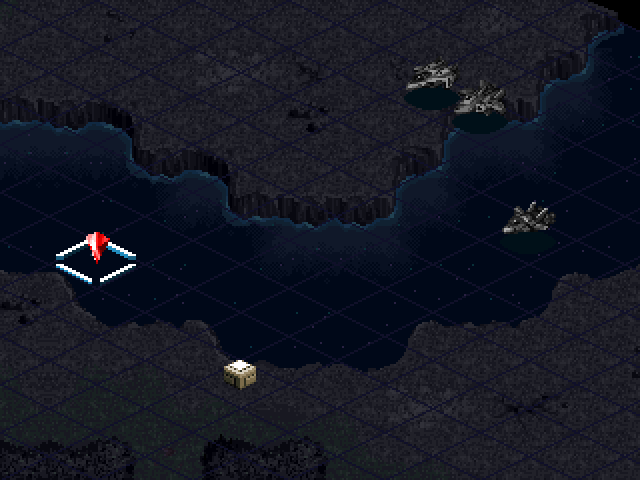 It's important that you don't get greedy and get this container with Isamu. 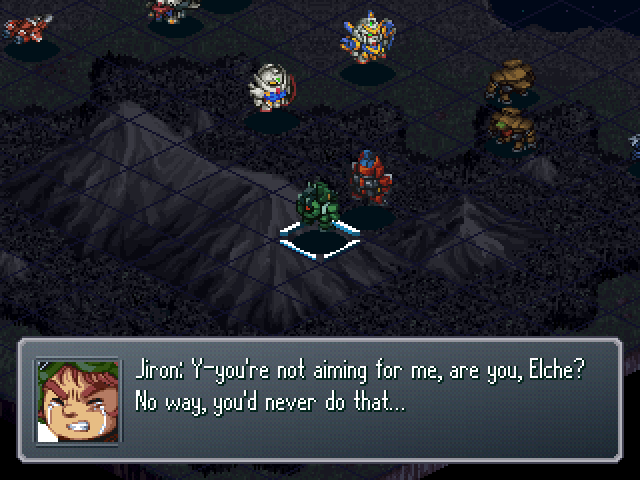 If you do, then you screw yourself out of getting the Skill point because Isamu wont be able to reach the exit in time. 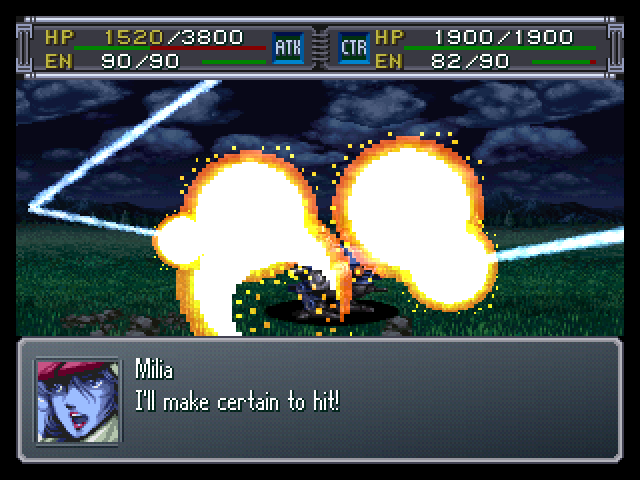 Milia continues to draw a small group away and manages to kill another one. Guld grabs the last container. 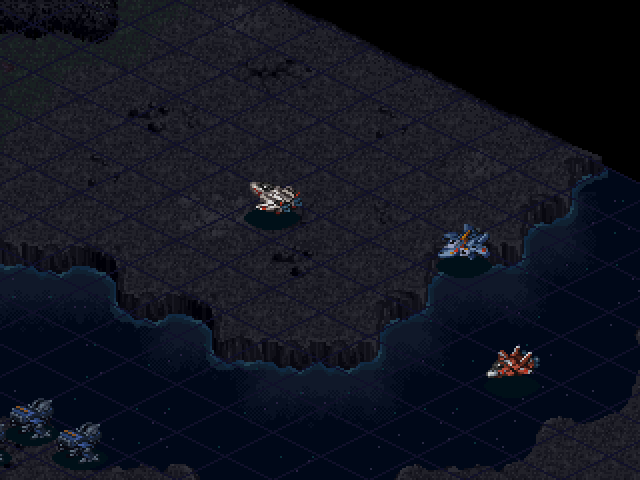 And Isamu just barely makes it in time. Step one complete. : We came to meet you! Did you get the Vaccine!? : Is the Iron Gear doing alright? 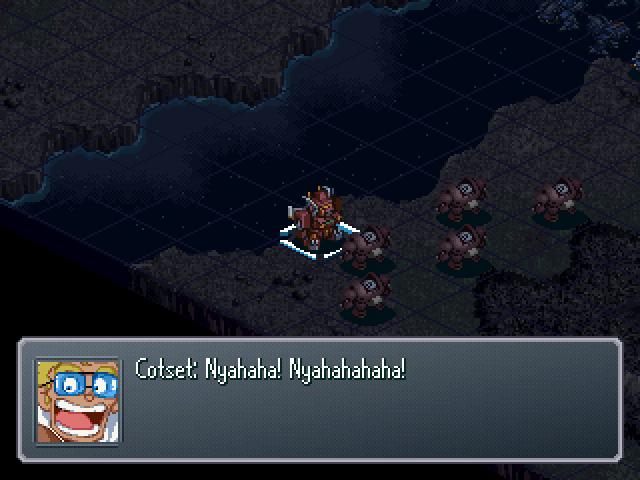 Cotset came down with Rat Fever, didn't he? : Well, for now I'm in charge of moving it. : Bring the Vaccine quick, please. We need to give it to everyone fast! : Roger that. 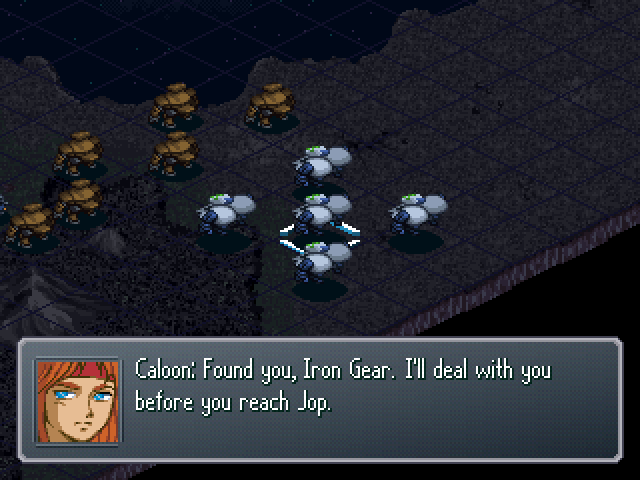 Isamu, get to the Iron Gear. 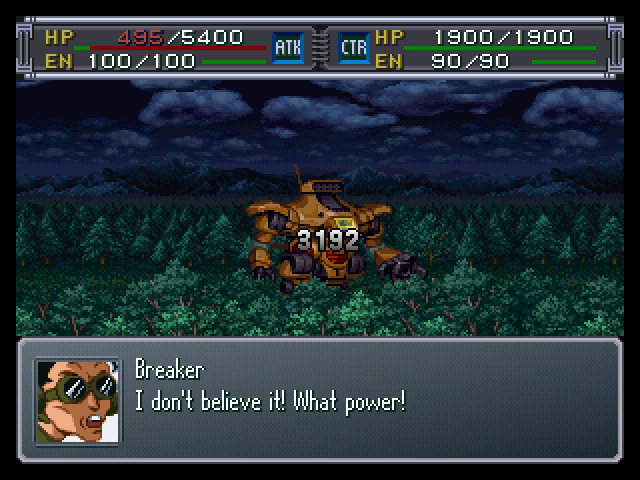 Isamu lands on the Iron Gear. : Jirooon! There are flying Walker Machines! : Again!? They just keep coming! : That voice... It couldn't be...!? Caloon! : Birin! You're still alive! : Is that so wrong? : What, is that someone you know!? 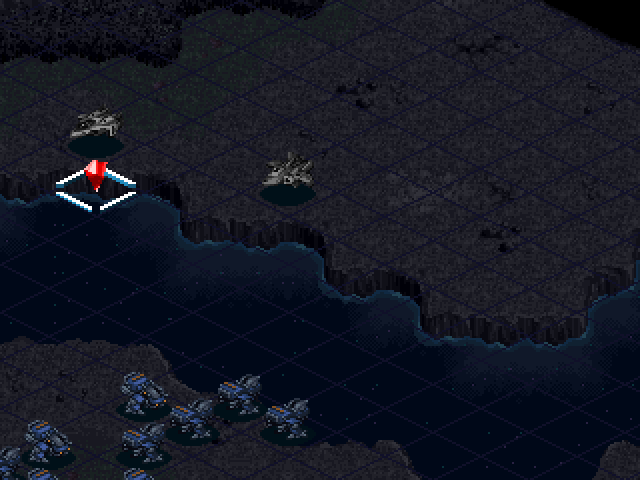 : Jiron, we're done administering the vaccine to all the pilots! : So you showed up. 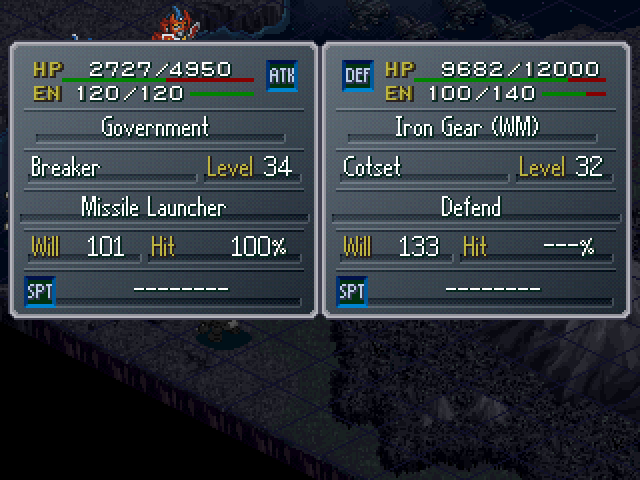 But my goal is to take out the Iron Gear at all costs! 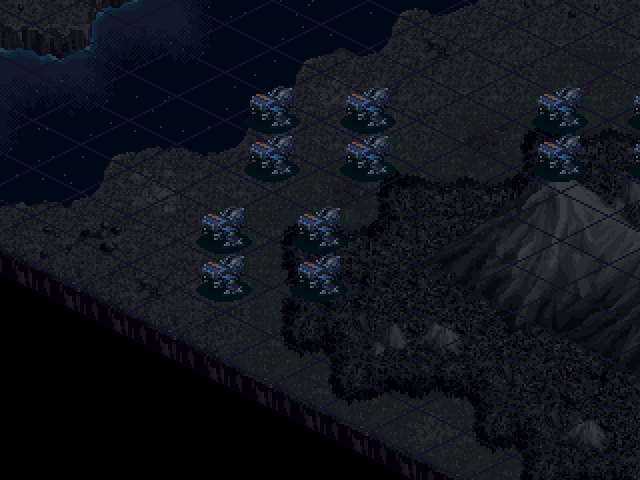 Come on out, seperate forces! 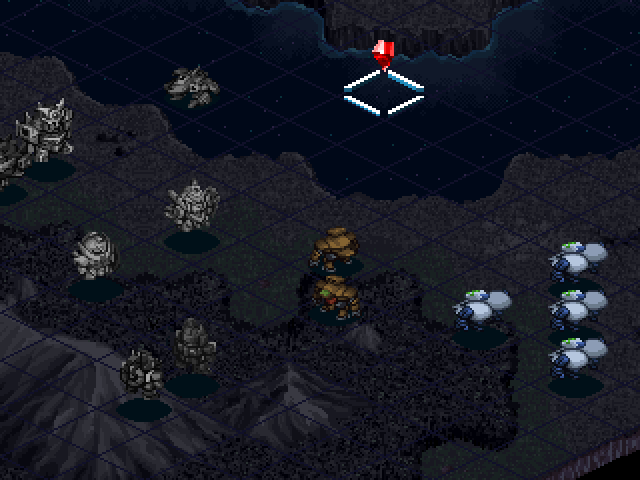 : Enemies in a place like that!? : This's bad! As it is, the Iron Gear can't move!! 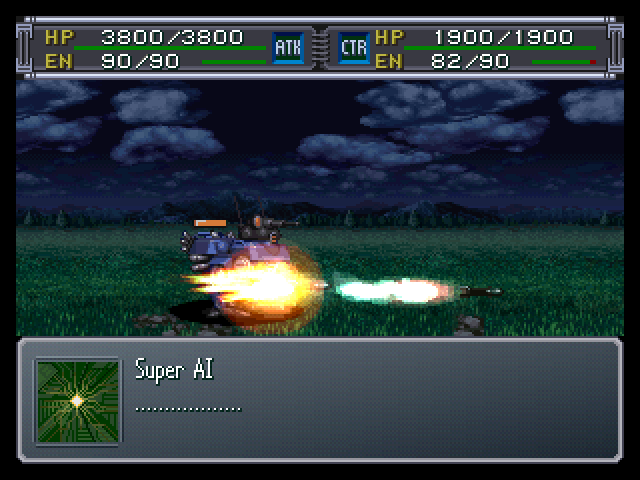 Suddenly, the Iron Gear transforms and begins charging at a nearby Government! Click here to witness the Iron Gear's Ultimate Attack! 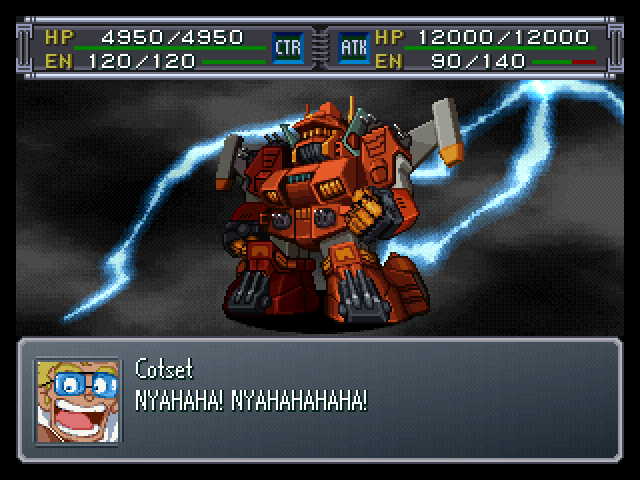 : C-Cotset's at the helm!? : H-he's out of control due to the Rat Fever! I can't stop him!! : Then just let him do what he wants! 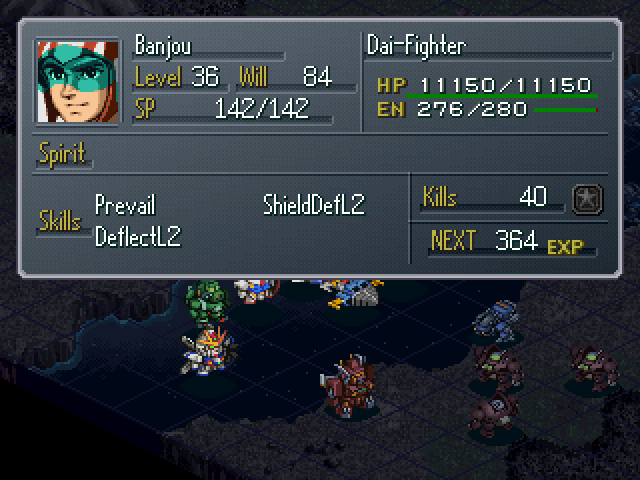 We'll take out the enemies!! 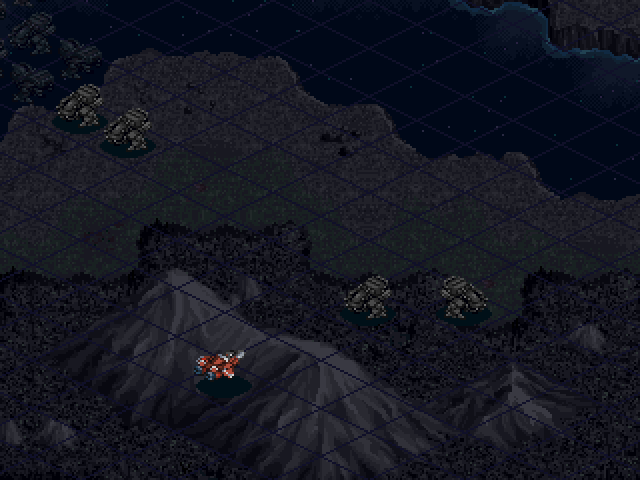 For the rest of this mission, we can't control Cotset and we will attack any nearby enemies. 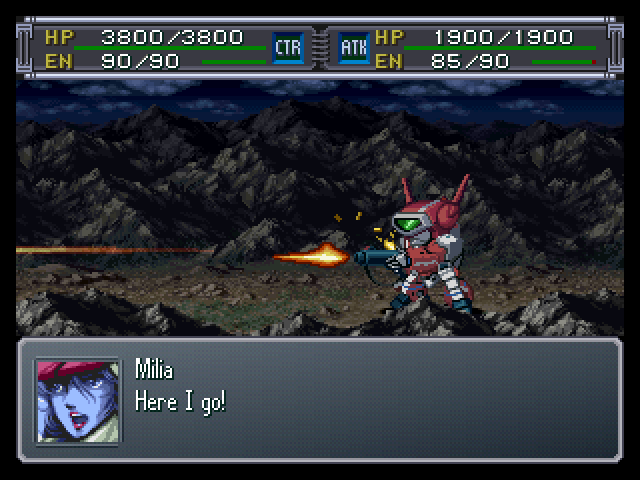 Milia continues to rain down death from the mountaintops while everyone else move towards available targets. 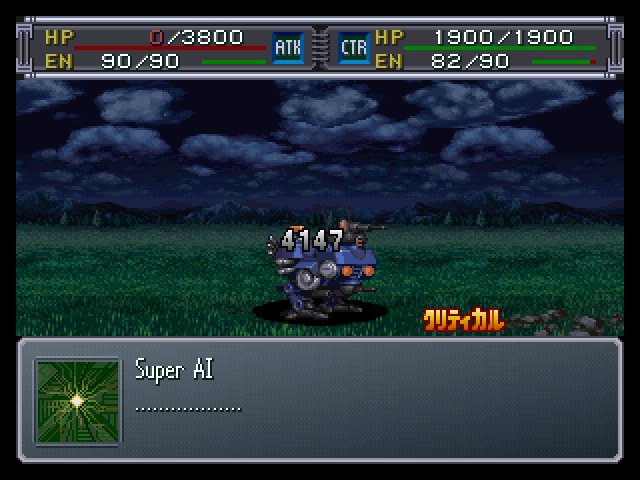 Cotset's AI is smart enough to defend against incoming attacks, so you don't have to worry about him getting destroyed anytime soon. On the next turn, I noticed something. 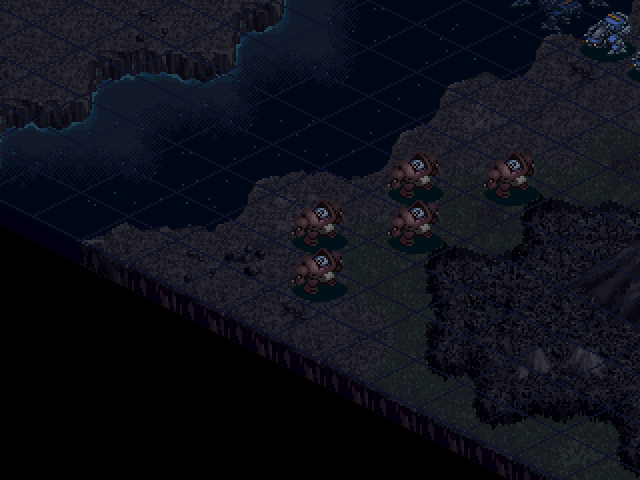 All of the pilots that were afflicted with Rat Fever start the mission with reduced Will. It's wasn't a major setback, but it was annoying. 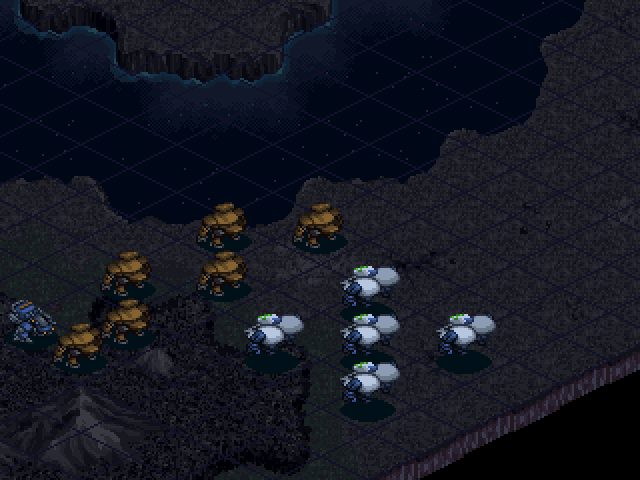 At the end of my turn, all of the Governements are destroyed. 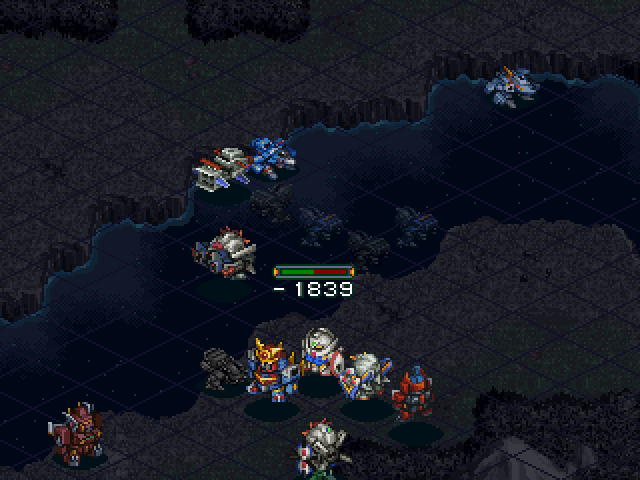 The Buran's in the river go after Max, which was fine with me, since he needed the EXP. 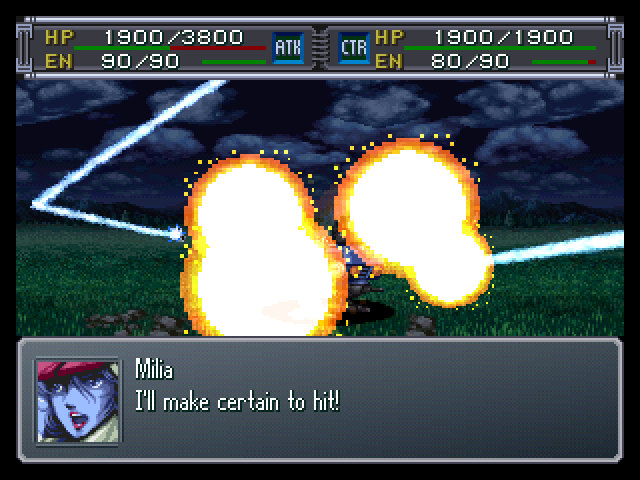 Milia uses up the last of her ammunition in a counter attack, but doesn't do enough damage to destroy him. 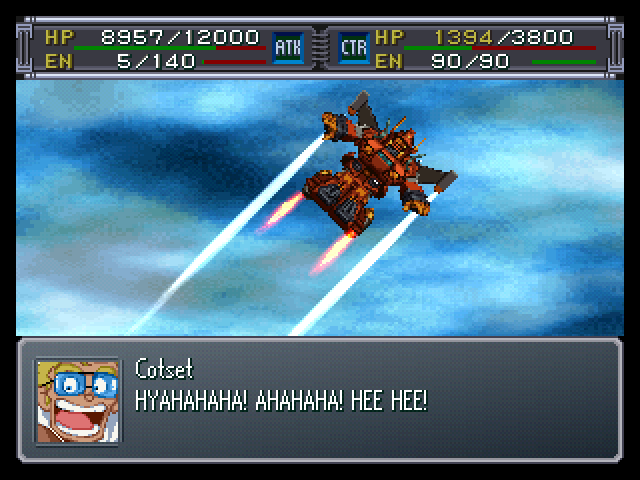 Cotset also uses up the last of his EN to destroy a Buran. 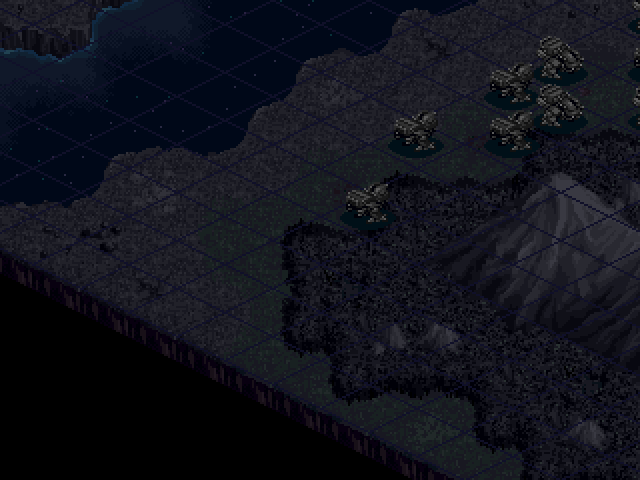 I continue on with my merry little path of destruction. 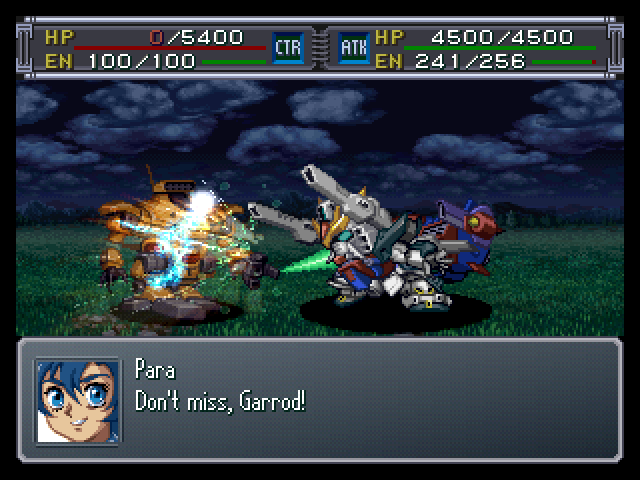 Even more enemy reinforcements show up... and is that another Iron gear!? : What the heck! ANOTHER Iron Gear!? Fatman seems to recognize the person in the Green Iron Gear. : What's the matter, Fatman? : It IS Elche! 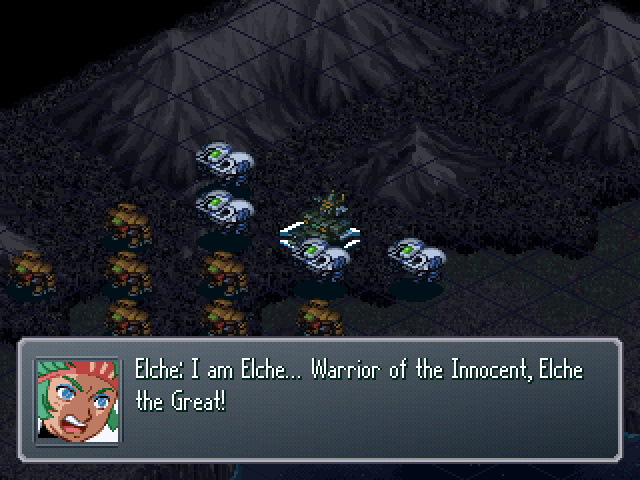 Elche's here!! : Heeyy, Elche! It's me! Jiron Amos!! : Elche, what's wrong? Oh, you must not be able to move. Hold on, I'll get you! 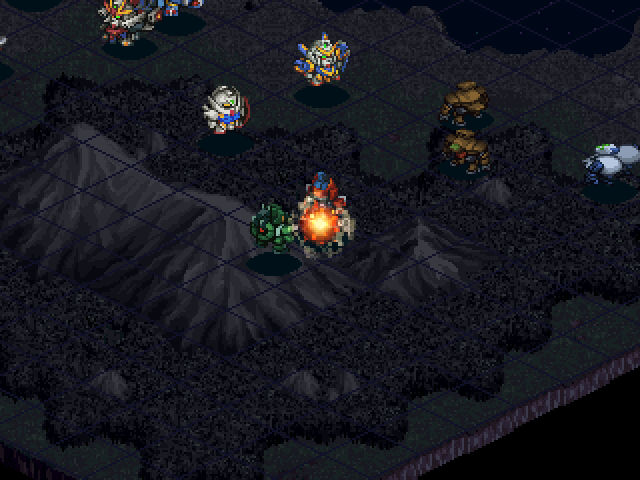 : Prepare for bombardment! I'll be sure to hit this time!! 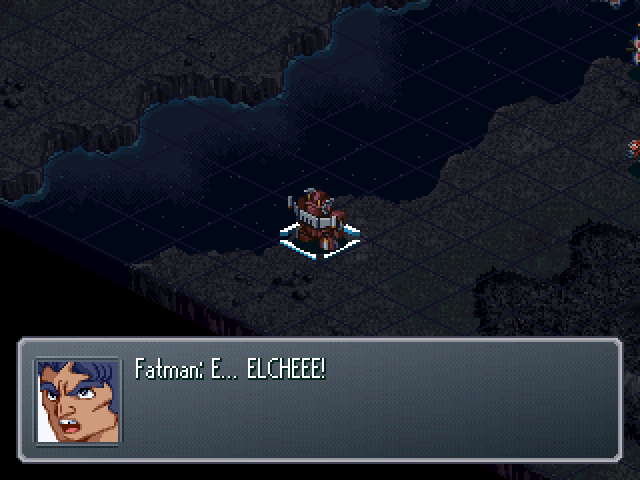 : really... Elche, how could you swear at me... Elche, you're not joking? : You think I'd let a man like you live? I'm going to eliminate you! : A man as terrifying as you... I can't let a man as terrifying as you survive!! 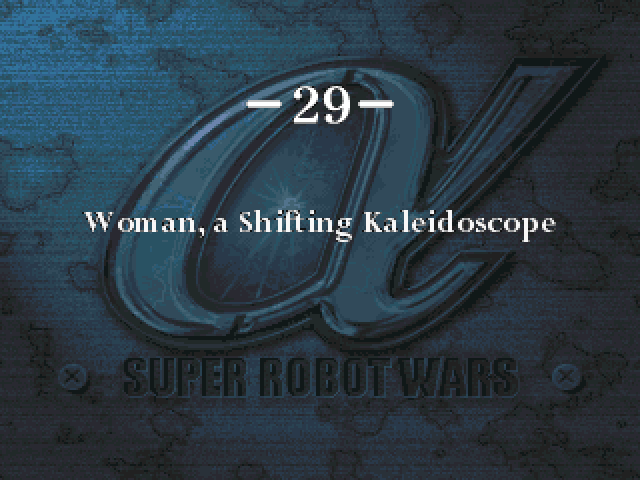 : Damnit, what in blazes happened to you!? : Silence! Jiron, and the rest of you irregulars who defy the Innocent! !